India is a country which does not see a shortage of schemes and plans for the development and well-being of its people. But most of the time, the fruits of these schemes never reach the targeted group and instead finds itself leaking through million bureaucratic sieves. Even in cases where there exist several systems and groups to ensure accountability and grievance redressal, reaching out to India’s millions of dispersed rural poor (or even a good majority of them) is a gigantic challenge. There is no single media that connects them with the systems that work for their benefit. There exists a vacuum. One of the main reasons for such a vacuum is the low penetration of any communication media in India’s vast rural landscape. However, recent studies show that the mobile user base in rural India is growing more rapidly compared to urban India. The root of the effectiveness of Gram Vaani’s platform lies in the fact that it uses low-end mobile phones to operate its voice-based interaction platform. 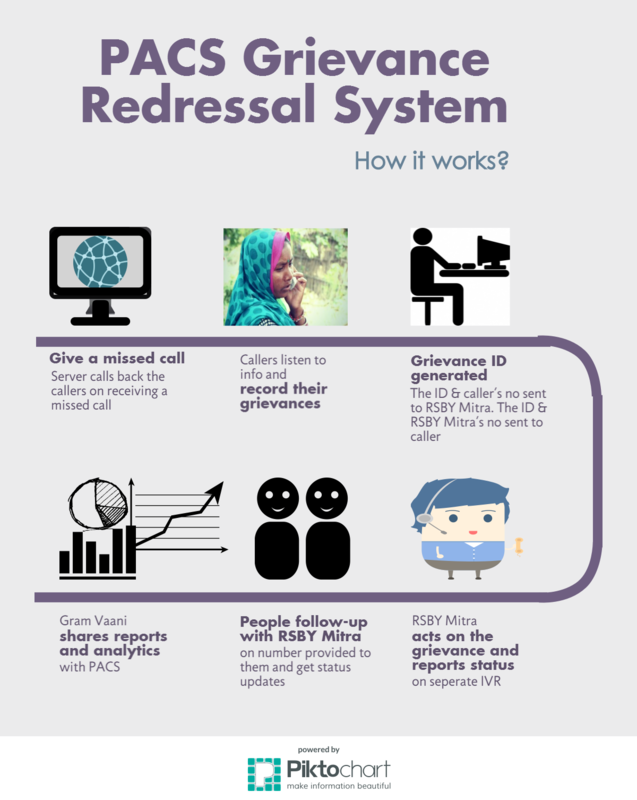 One such example is how Gram Vaani functions as the helpline channel for PACS grievance redressal system for RSBY. Rashtriya Swaasth Bima Yojna or RSBY is a government scheme that ensures anyone or any family (upto 5 members) enrolled in the scheme can get medical treatment up to Rs 30,000 in any empanelled RSBY hospital, which includes some private hospitals and the government run ones. This Insurance scheme is subsidised by the government. However, there are lots of grievances associated with the RSBY scheme right from the pre-enrolment to post-enrolment phases. The Poorest Areas Civil Society or PACS is an organisation that works with socially excluded groups in India. As a part of one of their projects, PACS works with the government department to ensure that the families classified as BPL “Below Poverty Line” enrol in the RSBY scheme and get its benefits. PACS has a network of “RSBY Mitra’s” who are PACS volunteers who do try to get the grievances addressed on an individual level. PACS volunteers often had limited impact because they were confined fighting cases in their areas only. There was no streamlined state-wide collection of grievances or problems associated with RSBY that could be presented to government officials. PACS therefore wanted to start a helpline number and Gram Vaani became the medium. This number not only worked as a helpline number that gave information about the RSBY scheme to increase awareness but also served as a Voice Media platform that registered grievances about RSBY from pre-enrolment to post-enrolment stage. In this way the Gram Vaani helpline number solved the problem of not being able to reach to the individual complaints and collect data in a large scale. Grievance redressal became more streamlined and PACS got the data and the statistics to follow up with government officials on RSBY-related grievances. They were able to ensure that the BPL families using the scheme are actually benefited by it. They could also prevent insurance companies getting away without paying money even in genuine cases because government officials/PACS don’t have the data to back the volume and nature of RSBY complaints/grievances.